Midfielder Chris Morrow has joined Irish Premiership side Glentoran on a loan deal from champions Crusaders until the end of the season. Morrow, the Northern Ireland Football Writers' Player of the Year in 2012 has struggled for regular first-team football at Seaview after suffering a number of injuries in recent seasons. Glens manager Alan Kernaghan has also signed Chris Lavery from Lurgan Celtic. Meanwhile Danny McKee has returned to the Oval after a loan spell with Ards. McKee was the hero for the north Down club as they progressed to the final of the League Cup by beating Coleraine in a penalty shootout in mid-December. McKee scored two headed goals to help Niall Currie's men come from two goals down to secure a 2-2 draw, then scored the winning spot-kick in the shootout. Glentoran lie sixth in the league table but suffered successive league defeats to Linfield and Dungannon Swifts during the festive period. 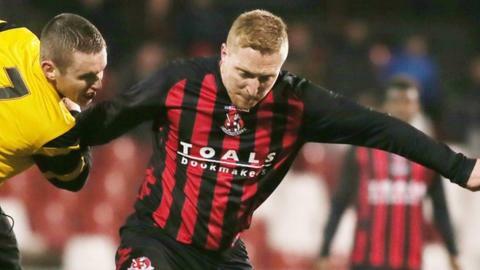 Crusaders have released former Derry City midfielder Barry Molloy after an injury-plagued 12 months at Seaview. Former Blackburn Rovers defender Mark Edgar has signed a two-and-half year deal with Coleraine, while Cliftonville goalkeeper Conor Devlin has agreed a new contract with the Solitude outfit.